Like my life and the changes it may go through, the jewelry I am interested in changes too. This is one of my favorite necklaces, by Waxing Poetic,it is called the Thin Rolo with Brass Beads Chain and it is 32 inches long and cost around $68.00. I have it with the Remedy in a Bottle Peace pendant it cost about $60.00, I love this bottle pendant, it's kind of "I Dream of Jeannie" like. 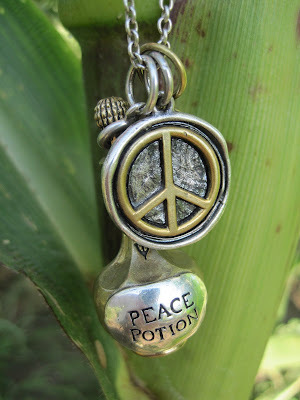 The other is the Wing and a Prayer Peace Charm which cost around $48.00, I can always use a little more peace. In both of these charms/pendants Waxing Poetic offers several different styles, the bottles come in Love Elixir, Wish Tonic, and more. I wear this necklace usually with the long "peace" necklace, but not exclusively. Again this is by Waxing Poetic,the chain is called the Flat Cable it is 18 inches and cost about $35.00. The charm is called the Whimsies Charm/Clover for around $43.00, they have several images to choose from. 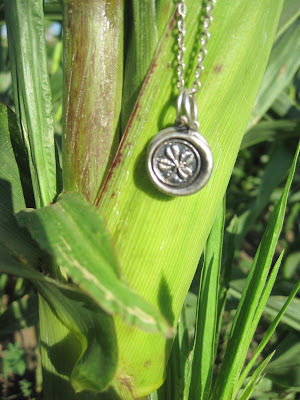 I have two charms on this necklace, but try to take a picture of your necklace hanging from a stalk of corn. Not easy! The charms really did not want to cooperate, so the next picture shows you the other charms. On any given day I never know which will be showing or if both will. I like it that way. 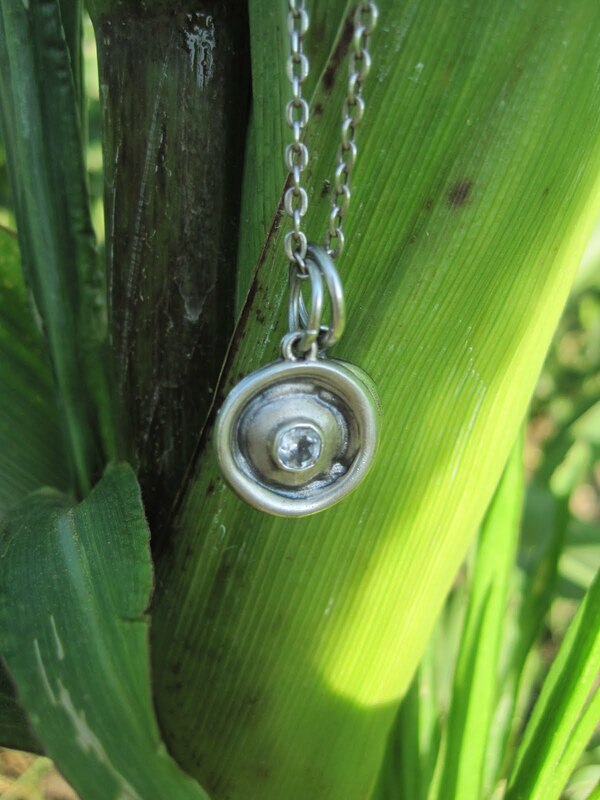 This is the Birth Ornament Charm which is about $38.00. No my birthday is not in April, but I like April's birth stone better and who wouldn't it's a DIAMOND!!!! Way, way, way, unfair to the rest of us. Waxing Poetic began in 2002, by two sisters and is based out of Los Olivos, California. Waxing Poetic is more than just necklaces and charms, I'm sure you'll find something you love as much as I have. 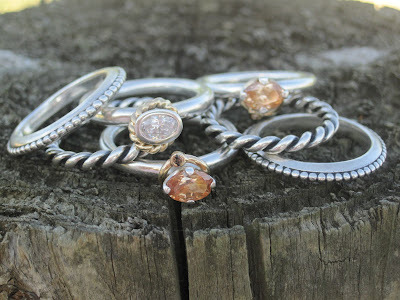 Check out all they have to offer: charms,pendants, necklaces,chains, bracelets, rings, and earrings Next on my Waxing Poetic wish list: Bracelets! Also on my list of new fav's are this Pandora stack able rings. You can mix and mingle them with anything. They are made to be all mixable or not, it's up to you. Best part is they are affordable and stylish. I love giant, huge rings and these are not big. So it was surprising to me when I did like them so much. I might be addicted, just a little. The sterling silver bands are from $30 to $35 dollars. The rings with stones are a little more only because they have a little gold on them, but even at $115 and $120 they are a great price. Again they are made by Pandora. Next up on my Pandora wish list: a Gray Pearl Ring for $55.00 to wear with the two twisted silver bands, and there is one other ring I love. They have a GREAT selection of both and you can try it on.